Do you struggle to think of activity ideas that will set your corporate event apart from the rest and give it the 'wow' factor? Well, look no further. First on our list of events that are bound to leave you and your guests with lasting memories is indoor skydiving. All the fun but none of the fear. If you think soaring like a bird is cool, but haven't quite got the courage to throw yourself out of a 'plane, this one's for you. Get the adrenaline pumping as you experience the equivalent of a free-fall skydive from 12,000 feet. These super-smooth, super-fast and super-cool wind tunnels are accessible to people of all ages and all abilities. With high-tech vertical wind tunnels spread across the UK, there should be one near you. So, whether you're looking to entertain five people or 50, it's pretty much guaranteed your group will be talking about their free-fall experience for weeks to come. You may have played football before, you may even have been zorbing, but have you ever played football zorbing? We're guessing not. The genius event combines these two completely different activities to produce a hilarious and unique version of a much-loved game. Take your guests to play 5-a-side wearing huge bubbles - replacing clever tackling with dramatic wipe-outs which are bound to get everyone laughing. Simple yet effective, the equipment can be brought to a venue of your choice and our events coordinator will organise the games. Not only unique and entertaining but also great value for money. What's not to love? Yes, we know, it's almost too good to be true. 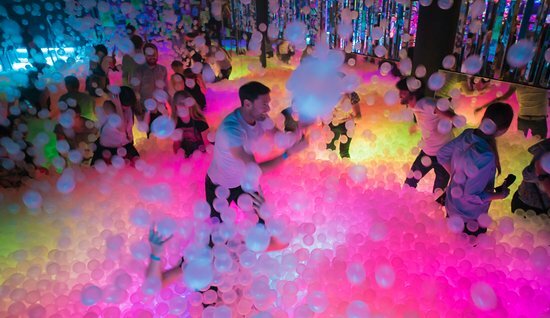 Take your group to relive their childhoods by frolicking through a UV ball pit whilst sipping on nostalgic, sweet themed cocktails. Our favourites are 'The David Bowie', which comes with its own glitter so you can pay tribute to the legend himself, and the 'Dibbie Daberson', which, of course, comes with a dib-dab. The perfect event for some much-needed team bonding outside of work, the venue is easily adaptable for all types of groups. There are numerous packages available to cater for up to 500 people, with options for a private meeting room and also a private ball-pit to ensure your group stays together undisturbed. Booze, balls, and brightly coloured walls. Sounds like a winner, doesn't it? This is an unforgettable experience for any group that will make you the most popular person in the office. Let's be real. Everybody loves gin. In recent years its popularity has risen to new heights as the UK has realised the trendy spirit's versatility. There's a number of places you can do this, but our favourite is The Ginstitute in Notting Hill. Here you can take your group for a sophisticated day out to learn about and drink lots of this fantastic spirit. After a brief educational talk about the history of gin, your Ginstructor will guide you through to the Blending Rooms to nose your way through an eclectic range of pure botanical distillates. Your group will then be able to choose their favourites and create their own personal blend of gin. To top it off, you'll each go home with your own bespoke bottle of gin plus a bottle of Portobello Road gin to enjoy. The session lasts around three hours. Cocktail making classes are a fantastic way to bring the team together, have some fun and actually learn something in the process. Your group will be taught the secrets of the trade by a qualified mixologist and what you've learnt will then be put to the test when you are each instructed to make four delicious cocktails (which we are assuming you get to drink afterwards, yum!). The activity can be arranged at various locations around the UK, but one of our favourites is Mixology in Shoreditch. We love the fact that in this class everyone is given their own individual bar, fully stocked and ready to go, making you feel like the real deal. Classes can also cater for non-drinkers with delicious mocktails. Your group are guaranteed to return home with lots of memories and some valuable new skills to impress their mates. 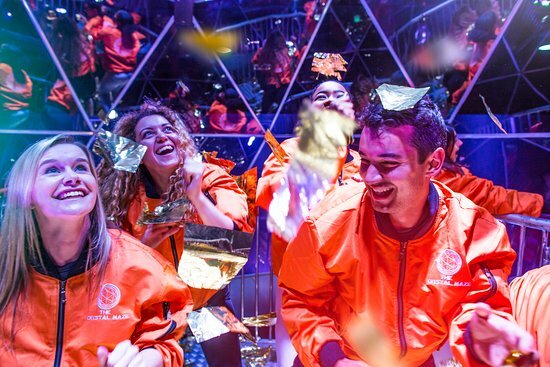 If you're looking for a fast-paced, adrenaline-pumping, team building event, the Crystal maze challenge could be for you. Star in your own version of the popular 90's TV show as you and your team test your skills, physical and mental abilities. This is the ultimate team bonding experience as you solve mysteries and face challenges together through four adventure time zones: Aztec, Industrial, Futuristic and Medieval - with the added bonus of wearing some seriously cool silk bomber jackets. Make sure to get some team pictures at the end looking like a 90's rock band. If you are less into adrenaline seeking and more into sightseeing - how about a day on the river? Your group will be given their very own punt to negotiate through the beautiful rivers of Cambridge, using teamwork to physically keep control of the boat whilst also solving crafty clues in pursuit of treasure. Armed with maps, the treasure hunt will have you running around the city as it has sections both on and off the river to really get the most out of the city experience. A similar experience can be arranged in Oxford, Stratford or Bath. One of London's best activities, this event combines beautiful views with a physical challenge. Climb to the 52-metre high summit of one of the city's most famous buildings for an unforgettable experience. Nervous? Don't be! You'll be kitted out with your very own climb suit, boots and harness so there is no danger of falling off the 380-metre walkway, in case you were wondering. Get the blood pumping with this team challenge that will get you working together and talking about it afterwards. Suitable for all group sizes and for groups of 30 there's a private climb option with a personal guide to really impress your guests. It's the perfect group starter event before heading out for drinks in the city for a fabulous evening. Active have over 20 years' experience in delivering successful corporate events. For help with your next event, please contact us.